← Two great words come together in one great taste…Pumpkin Butter! 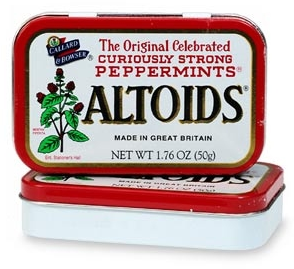 Seriously, peppermint Altoids make me sneeze when I bite down on them. What’s up with that? Posted in Minty. Bookmark the permalink. I sneeze, too!! But I adore Altoids! I am never without a tin…. They make me sneeze almost every time! I always still eat them whilst doing homework anyways. Thank you for confirming the sneeze factor.